He is also a man who has a hard time paying the bills. These are sums worth fighting over, even for a billionaire. The entirety of Justice’s empire rakes in some $450 million in annual sales (their number), mostly from mines, farms and the Greenbrier. The biggest chunk: the decades-old Bluestone coal mines, which will extract an estimated 2 million tons this year, fetching in the neighborhood of $270 million. It’s a low-margin affair: Annual profits to the Justice family are probably on the order of $20 million. Even if it takes years to get squared. Particularly instructive is the case of Kentucky Fuel, one of more than a dozen coal mining companies owned by Justice and his children and run out of Roanoke, Virginia. In 2014, Justice personally signed an agreement with the state of Kentucky promising that he would “unconditionally and irrevocably guarantee” that reclamation work on Kentucky Fuel’s mines would be completed by November 2015. In return, Justice negotiated down $4.5 million of civil penalties to just $1.5 million. Fast-forward to 2019. The work is still not done. Kentucky’s Energy and Environment Cabinet (the state’s EPA) has asked a judge to snap back the remaining $3 million in fines, plus interest. The agency says it no longer trusts Justice’s companies. Justice companies have filed personal lawsuits against state employees, alleging in one case the “malicious” closure of a Justice-owned mine. The agency says Justice is attempting to “intimidate the Kentucky government into renegotiating” the 2014 deal. So the agency has advised its employees to be careful: “Because the Justice defendants have no apprehensions about filing personal lawsuits based on falsehoods and fabrications, Cabinet employees have been instructed to avoid speaking with the defendants without a Cabinet attorney present.” Agency attorneys have expressed awe at the mendacity, arguing in court filings that “few will choose public service if coal billionaires are allowed to intimidate state employees with impunity.” Justice says Kentucky “should forever be most appreciative” for the work he’s already done. Old coal mines are not the only liabilities that Justice’s companies have in Kentucky. Tim Bates, the attorney for Kentucky’s Knott County (pop. 15,000), sued Kentucky Fuel last year, seeking $2 million in back taxes—vital funding for rural schools. After getting no response, a court-appointed receiver will now seek to seize and auction off any Kentucky Fuel assets it can find in the state. Both are unabashedly populist billionaires who inherited businesses in cutthroat industries and built those companies into larger empires. Like Trump, Justice has a history of not paying vendors. Like Trump, Justice makes excuses for not putting more than a handful of his bewildering array of companies into a blind trust while serving in public office. Like Trump, Justice says his children—son Jay and daughter Jillean—are running the empire. 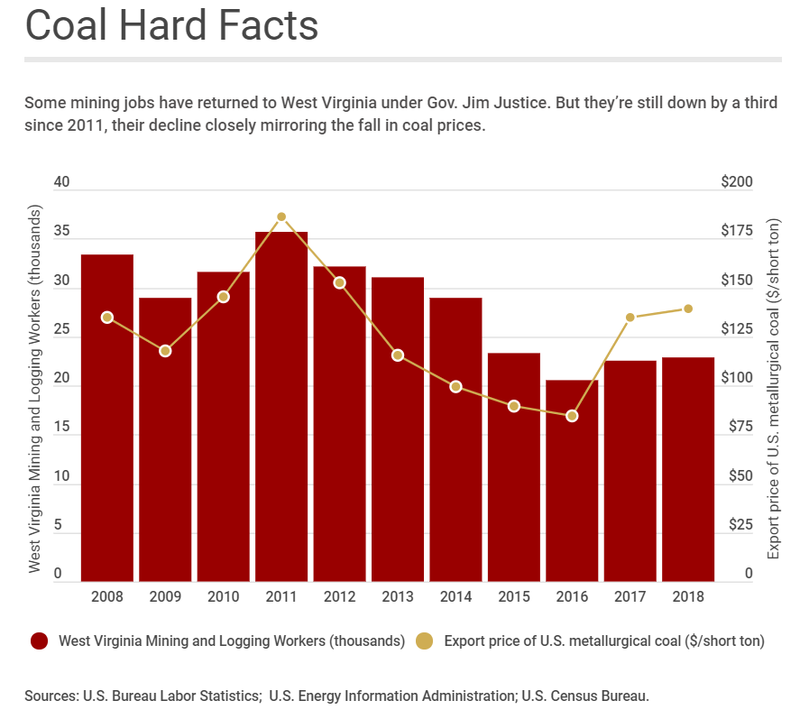 But, unlike Trump, Justice grew up in coal country. His dad, James Sr., studied aeronautical engineering at Purdue and was an Air Force captain during World War II. He cofounded coal miner Ranger Fuel in the early 1960s and then sold it in 1969 for $70 million (about $485 million in today’s money) to Pittston, a Virginia-based mining concern. In 1971, Jim Sr. formed Bluestone in the coal fields of West Virginia’s McDowell County. For two decades Bluestone produced 500,000 tons per year of what’s known as metallurgical coal, a premium hard coal with high heat content for use in steelmaking. Justice worked for his dad for decades, but he still remembers going into his father’s office when he was 19 with a problem. “I said, ‘Dad, there’s nothing I can do,’ and all of a sudden the desk explodes and he grabbed me around my shirt and slammed me down against that desk and said, ‘Damn you, there’s always something you can do, and you damn well better always remember that.’ ” When his father died in 1993, Justice took over. Also like Trump, Justice has complicated Russian connections. In 2008, the average price of metallurgical coal jumped over 50%, and Justice’s Bluestone sold 2.8 million tons of it that year. That attracted the attention of Mechel, the Moscow-based mining giant. In 2009, Justice sold Bluestone and its 725 million tons of reserves to Mechel for $436 million in cash, a chunk of preferred stock, plus the assumption of more than $100 million in debt. On top of all that, the Russians were contractually on the hook to buy additional coal from Justice. He found reserves that he said were worth $165 million. Mechel balked, claiming the coal was worth only $25 million. Justice denies the allegations: “They struggled in not knowing how to run Bluestone the way we would.” He countersued and won a court order demanding that Mechel open itself up to an aggressive discovery process. Preferring to wash its hands of the deal, Mechel sold Bluestone back to Justice in 2015 for $5 million, plus the assumption of at least $140 million in liabilities, and each side dropped all claims against the other. Since taking back Bluestone, Justice says, he has “cleaned up $60 million of reclamation liabilities left from the Russians,” paid $30 million owed to vendors and $20 million in taxes, and rehired 250 workers. Those rock throwers include the Internal Revenue Service. Even when faced with court judgments and tax liens, Justice has shown that he prefers to fight. In June 2017 the IRS, looking to collect more than $1 million in back taxes, issued a levy to Pinnacle Bank, ordering it show the contents of any accounts held in the name of six Justice companies. Bluestone wasn’t on the list, but its account was linked to the others. The bank froze $1.4 million in the account, for which Justice unsuccessfully sued Pinnacle. Last year a U.S. district court in Virginia ordered $1.15 million of the cash transferred to the feds, while $250,000 went back to Bluestone. There’s a long history of creditors trying to get their hands on Justice’s money—even his own attorneys. Phelps Dunbar, which represented Justice in a 2011 case in Louisiana, sued one of his companies for $400,000 in unpaid fees. The case was settled. Billy Shelton, who represents Kentucky Fuel, had to get a court judgment in 2013 for $85,000. Incredibly, Shelton continues to represent the company. In December 2017, a U.S. district court in New York issued a judgment for $843,000 against Justice’s Southern Coal in favor of National Union Fire Insurance Co. That judgment was transferred to West Virginia, where the U.S. Marshals Service was tasked with seizing assets from Southern Coal accounts at banks that included Wells Fargo and JPMorgan Chase. The marshals found nothing but closed or empty accounts. In January, the court appointed a special commissioner to help get to the bottom of it. Justice tells Forbes he plans to settle this one for as little as $150,000. Another plaintiff, James River Equipment, sued Justice Energy in 2013 (when it was temporarily owned by Mechel) over a $150,000 unpaid invoice. Justice may have inherited the problem, but his foot-dragging and finger-pointing have made it much worse. In 2016, after the Justice family had reacquired the company, U.S. district court judge Irene Berger considered jailing a Justice Energy rep for not showing up at scheduled hearings and sanctioned Justice Energy for contempt of court while also entering a judgment in favor of James River. The judgment and penalties now add up to $1.2 million, which Justice has shown no inclination of paying promptly. Last year Justice’s lawyers appealed to the Fourth Circuit Court of Appeals, which upheld Judge Berger’s ruling. “We thought with his success in business he would have forged relationships and parlay that into investments in West Virginia,” says Corey Palumbo, a Democratic state senator. “He hasn’t.” A much-hyped $84 billion deal with a Chinese energy company looking to invest in West Virginia natural gas has stalled, a victim of Trump’s trade war. All agree that the state needs to invest more in entrepreneurs, but it’s harder to attract them when the face of your state is a deadbeat billionaire. “Business owners and entrepreneurs expect an even playing field when choosing where to locate. They want everyone—the governor included—to be treated equally under the law,” says Republican delegate Joshua Higginbotham. There’s also a strong sense that Justice is too distracted to be doing a full job for West Virginians. Isaac Sponaugle, a Democratic delegate, has filed a lawsuit meant to force Justice to abide by the state constitution’s requirement that the governor “reside” in Charleston, the state’s capital. Justice says he doesn’t need to live in the governor’s mansion when he’s perfectly comfortable in his modest house in Lewisburg. “I’m not going to throw the state’s money away, and I don’t need somebody taking care of my laundry,” he says. Justice responds that Manchin is a “slick” politician. “He has an axe to grind.” Indeed, last year Justice fired Manchin’s wife from her job as state secretary for education and the arts. Justice says he’s getting right with all his creditors and that he’s owed lots of money as well—like the $70 million he’s trying to get out of insurers for 2016 flood damage at the Greenbrier. His son says the companies’ reclamation liabilities are “a thimbleful” of what they used to be.